Vitiligo is quite a common condition which makes the skin and sometimes the hair, turn white in patches. This is because melanocytes, the cells which give the skin its colour have been damaged. Vitiligo is not contagious. You cannot pass it on to someone else by touching them and it's not infectious. Vitiligo is considered to be an ‘autoimmune’ condition in which the immune system attacks the body’s own tissues. • Vitiligo affects at least one person in every hundred throughout the world, including in the UK. • Anyone can develop the condition, whatever their skin colour or ethnic origin. • Vitiligo can begin at any age but about 50% of people develop it before the age of twenty. The most common form of vitiligo appears in symmetrical form (generalised vitiligo) affecting both sides of the body. In some cases only one half of the body is affected (segmental vitiligo); this type has limited progression and is more difficult to treat. Vitiligo can spread to cover the entire body surface (universal vitiligo) but this type is not common. The way the condition develops varies from one person to another and unfortunately it's unpredictable. Some people may not notice a change in their condition for many years whilst for others it can spread quite quickly. In some cases, the white patches can regain their colour without the person having any treatment. This is more likely with children. However, it's very unusual for the condition to be resolved completely without treatment. At present, there's no 100% cure. Established treatments can be effective in re-pigmenting the skin, sometimes completely. However, at present, there are no treatments that can prevent vitiligo developing again. The causes of vitiligo are not fully understood. Pigment producing cells (melanocytes) are not functioning properly in the white patches, although some of them survive, both in the skin and in the hair follicles of the affected area. There are a number of theories to explain the loss of pigment; the most popular being the ‘autoimmune’ theory which suggests that the body’s own immune system is attacking the pigment cells. • Hormonal changes in the body, for example during adolescence. • Damage to the skin, for example from a cut or sunburn. • Contact with certain chemicals. The most important treatment is to protect areas of vitiligo from the sun. It's very easy for areas without pigment to become sun-burned. This increases the risk of skin cancer. 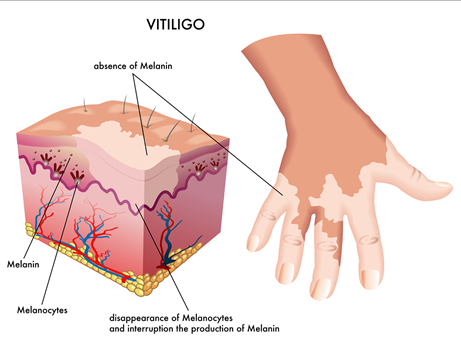 Wear sun-protective clothing and/or apply sunscreen with a sun protection factor (SPF) of at least 30 to areas affected by vitiligo. • Non-prescription topical medications such as ViTiX gel. Visit the AAD website for more information about Vitiligo.